Since the ancient times hydrotherapy is considered as an effective treatment for human beings. Documentations have proved that several attempts had been made to formalize the practice of hydrotherapy as a treatment during 18th century. Until recent times canine experts did not spare thoughts over hydrotherapy as an effective treatment for a number of conditions in dogs especially in the medium to large dogs such German Shepherds, Labrador Retrievers, Rottweillers, Mastiffs etc. Certain conditions in canines - especially in GSD may worsen or may show almost no improvement with exercises that was once considered to be useful. As a good alternative to general treatment through medicines and exercises, "hydrotherapy" is now considered as one of the most effective treatment of such conditions like hip and/or elbow displasia, Osteochondritis Dissecans (OCD), Chronic Degenerative Radiculomyelopathy (CDRM) etc. 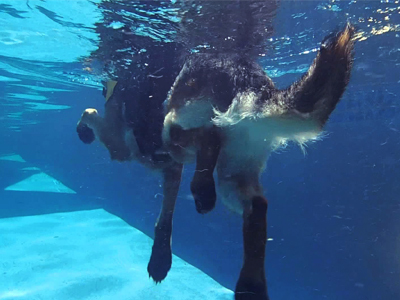 Degenerative Myelopathy (DM), which is a progressive disease of the spinal cord in older dogs especially found in medium to large breeds can be effectively treated by hydrotherapy. Hydrotherapy treatment has also proved to be quite effective in small breed of dogs having Luxating Patella or floating kneecaps. Modern veterinary science also recommends hydrotherapy treatment to dogs having ligament injuries, obesity problems and any other mobility issues. Significant development can be noticed with this treatment method by employing a professional canine hydro therapist. Veterinarians and experts considers that swimming or moving in water has favorable therapeutic effects in pre and post surgical rehabilitation, increasing body awareness, developing mental and physical balance and last but not the least, for maintaining general fitness and developing muscle tone.